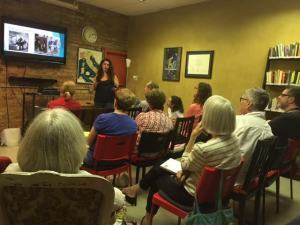 On Tuesday, June 21St, Alice Izzo, born and raised in Napoli, presented her h omeland at Sentieri Italiani, taking students and travelers on a virtual tour of Southern Italy’s beautiful Campania region. Alice explained much about Campania’s art, culture and legends. The journey began in Napoli where we walked together through the churches, museums and castles in Alice’s slideshow. 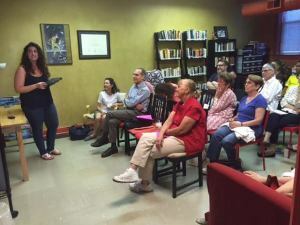 We learned about the fascinating history of the South of Italy and the different cultures that lived there, shaping the cultural and social habits of the people of the Campania region. Then, we walked through the archaeological site of Pompeii. Founded between 6th and 7th century B.C, this UNESCO World Heritage Site is one of the most popular tourist attractions today in Italy. There is a simple reason for this: the lava of the Vesuvius’s eruption in A.D. 79 allows us to witness today a 20 00-year-old , 660 000 square meters, Latin city. The chemical elements of the lava ash preserved the city as it was millennia ago. 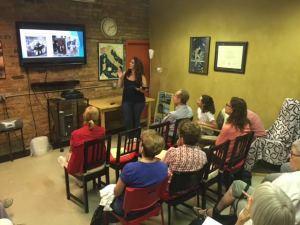 Our virtual tour continued to the Ama lfi coast and Sorrento to view the amazing beaches and the colorful panorama of the hillside cities. Our last stop was Paestum, an ancient Greek colony city founded around 600 B.C. and nowadays one of the most important UNESCO World Heritage Site thanks to the perfect conditions of its Temples. 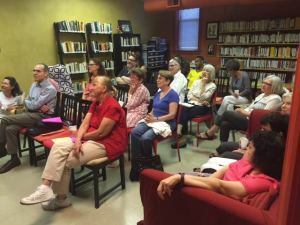 If you had fun at this Sentieri event, or would like to join us in the future, get added to our events mailing list today! Or keep an eye on our regularly updated events page!